Prospects of Modi-Sharif dialogue in Ufa? There are limited prospects for a dialogue between the Indian and Pakistani Prime Ministers at the SCO summit in Ufa, but analysts are hopeful that a courtesy meeting will at least break the deadlock between the two countries and maybe even turn into something more substantial. Indian Prime Minister Narendra Modi called Pakistani PM Nawaz Sharif earlier this month and conveyed good wishes for the holy month of Ramzan. News reports suggest that the telephonic conversation has reduced the trust deficit and opened avenues for more talks. There are, however, doubts about whether a telephonic conversation after a long hiatus would help contribute to the dialogue process in terms of further engagements at higher levels, and whether the two leaders would even have a dialogue on the sidelines of the Shanghai Cooperation Organization (SCO) summit in the Russian city of Ufa next month. Bilateral relations have cooled in recent months, ever since the Pakistani High Commissioner hosted separatist Hurriyat Conference leaders from Kashmir in New Delhi last August, despite Indian government objections. India’s foreign secretary visited Islamabad in March, but the visit did not ease the tensions. The release of Zaki-ur-Rehman Lakhvi, one of the masterminds behind the 2008 Mumbai terror attacks, has further soured relations. Modi’s statement in Dhaka earlier this month, that Pakistan created a ‘nuisance’ for India, and that New Delhi had played a role in the creation of Bangladesh incensed Pakistan. Similarly, a statement by an Indian minister that India’s anti-terrorist operations inside Myanmar, along its eastern border, could be replicated on its western border, further incensed Islamabad. With bilateral relations near a dead end, Modi’s call to Sharif broke the ice. There has been no dialogue, no officials’ meetings, and no joint sporting ventures such as cricket matches. International diplomats and organizations have expressed concern at the stalled relationship, with fears that the uncertainty may be used by radical elements to their advantage. While Modi has interacted with Sharif earlier, the call on June 16 was a timely gesture to perhaps salvage ties. Conveying his good wishes for Ramzan, Modi also told Sharif that India would release 130 Pakistani fishermen as a goodwill gesture. Both leaders expressed willingness to work to develop friendly, peaceful and cooperative relations between the two countries. The Pakistani media welcomed the conversation. The leading Pakistani daily, Dawn, wrote in its editorial on 18 June, “…thankfully for all those in South Asia who are put off by such brinksmanship and favour the path of peace, temperatures were brought down a few notches on Tuesday when Narendra Modi called Nawaz Sharif to extend Ramzan greetings before the advent of the fasting month”. Will this transform into a full fledged dialogue? The previous NDA government under Atal B. Vajpayee witnessed the strengthening of India-Pakistan relations with Vajpayee riding a bus to Lahore and signing the Lahore declaration. Will Modi be able to revive the spirit of Vajpayee, with a corresponding gesture from Sharif? A meeting in Ufa can be an opportunity. Russia is friendly with both countries. In the past few years, relations between Russia and Pakistan have developed significantly. Almost all of Pakistan’s ministers have visited Russia in recent years. Pakistan’s Army Chief visited Moscow this month. Russia and India share friendly relations. Russia may design a suitable policy to balance its relations with both South Asian rivals without antagonizing either. It may be naïve to expect a Tashkent type Russian role in bringing together the two countries, but Russia is well placed to offer its good offices for talks between the two leaders on the sidelines of the SCO summit, on July 9 and 10. India and Pakistan will most likely be declared as permanent members of SCO during the Ufa summit. Russia has actively supported the membership of both countries. The Russian leadership understands that cooperation between India and Russia is not only necessary for peace and stability in the two countries, but also in regions like Afghanistan and Central Asia. The SCO, which emerged as a group to fight terrorism and ensure peace and security in Eurasia, will benefit from friendly relations between the two South Asian countries. The odds against a dialogue between India and Pakistan are many. There is a report that Modi may not participate in SCO summit if India is not given a permanent membership. In such a scenario, the prospects of a dialogue in Russia will be minimal. The past few days have witnessed India-China relations reaching a new low, after China blocked a UN censure of Pakistan on Lakhvi’s release, proposed by India. China is not enthusiastic about a more active role for India in the SCO. It may prefer Pakistan, its traditional partner, to India, its traditional rival, and opt for slowing the process of admitting new permanent members to SCO. 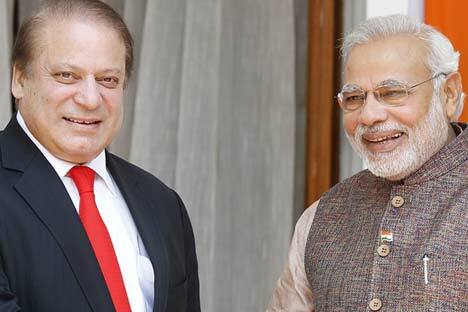 Ufa provides a unique opportunity to Modi and Sharif to engage in dialogue. Both are considered dynamic and progressive leaders. While Modi has strong domestic support, Sharif’s support base is squeezed by the army. A meeting between them would certainly put the fragile peace process back on the rails, and enhance trust and peace. Russia can play a constructive role in this direction by using its diplomacy and leverage on both countries.